A colour photograph of 300 Byron Street North. This house at 300 Byron Street North is located on lot 57 of Perry's Plan, on the north west corner of Byron and John Streets. 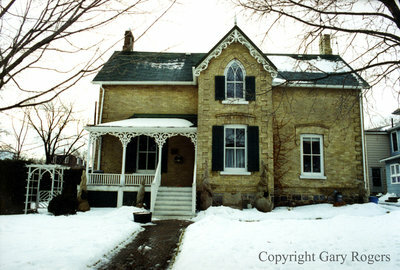 Mr. William Robson built the house circa 1871 as a vernacular two storey yellow brick house with gothic style detailing at the front and a rear two storey wing of frame construction. Mr. Robson married Elizabeth McMillian in 1859 and they had eight children, 4 boys and 4 girls. Mr. Robson died on 21 June 1907.